Conscious of the challenges facing scientific research laboratories in sectors as diversified as microbiology, agrifood, biopharma, materials engineering, mines and metallurgy, and biotechnology, any addition of new products is subject to rigorous criteria. Our supplier base is extensive, comprising of manufacturers that set the standard in their domain, recognized for their innovation, quality, durability and simplicity of use. This partnership with international suppliers positions Laval Lab to offer the latest technologies in laboratory equipment at the best price possible. The equipment we offer ranges from sample preparation (milling, sample division, XRF spectrometry), particle size analysis (sieve analysis to nano particle size analysers), to zeta potential and surface tension meters. We also offer a complete range of accessories and complementary equipment and services that might be required. 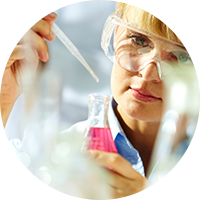 Laval Lab is committed to customer service and has established their reputation with research centers and university research laboratories. Our partnership with world reputed manufacturers, combined with the technical experience and product knowledge of our representatives, positions Laval Lab to respond quickly and effectively, even for the most stringent demands in laboratory equipment. We offer solutions that are both practical and economical, and meet scientific and laboratory standards. Our highly qualified personnel communicate directly with researchers to offer the customer support required. To this end, our directors encourage staff, already university graduates, to continuously update their training. They also receive training on the operation and functionality of new equipment. Laval Lab, our representative is your resource for information during planning and purchasing, and their support continues during installation and training. They are there to offer technical support for the life of the instrument. Our attention to detail and expediting ensures timely delivery of your order. Our team is available and has a constructive approach for services (turnkey operation). A range of products with durability and quality for a long term investment at the best price.